This sparkly angel mobile is full of Christmas spirit and fun to make from simple, affordable and easily-acquired craft materials. Children of all ages will enjoy creating it, and even very little ones will be able to get involved with adult assistance. As well as being a great boredom-buster during the school holidays, it’s a fabulous end-of-year festive activity for school groups and vacation programs. 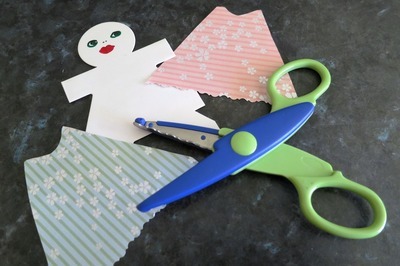 As with most craft activities, this activity is very versatile, so if you haven’t got some of the materials mentioned below, substitute them with those that are more easily available. 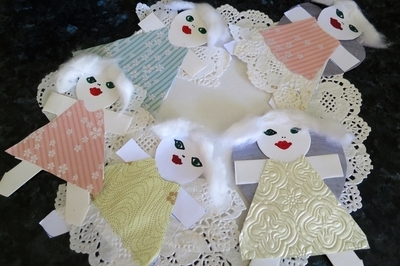 Finally, if you’d prefer to do something else with your Christmas angels, why not attach them to some colourful ribbon to create decorative bunting, or use the angels individually for your festive season home decor? 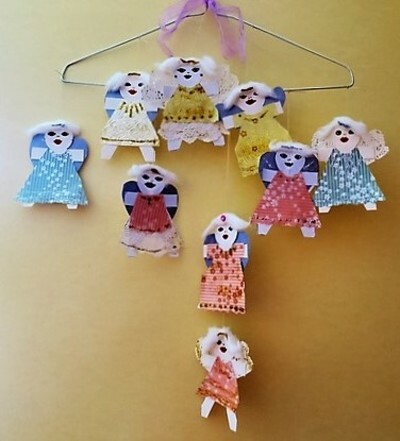 Paper doll chain (these can be purchased from many craft shops or you can print your own from a template off the internet), or individual paper dolls. 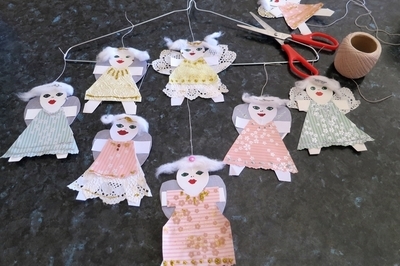 If you’re using a ready-made paper doll chain, cut each doll so that it's separate. 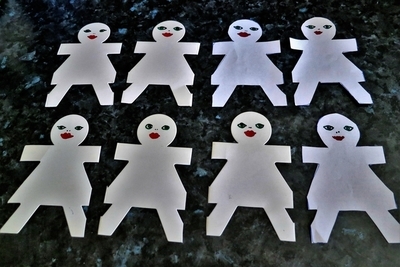 Alternatively, you could print a template for your own paper dolls (or a chain of them) from the internet. A couple of links can be found here and here. 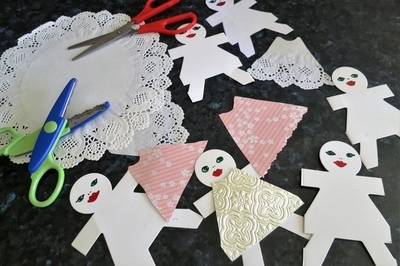 You’ll need between six and ten paper dolls for this activity. 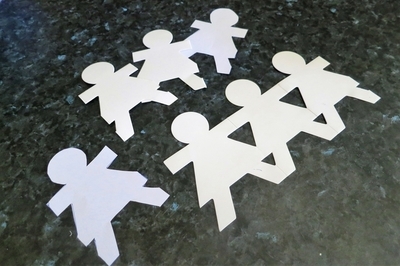 If you’ve printed paper dolls from the internet, these can now be glued onto cardboard and then cut out. 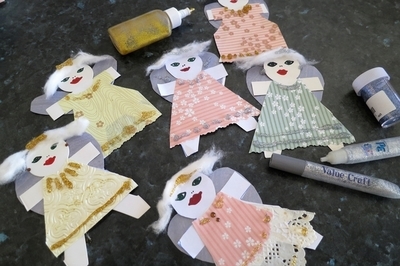 Using colour felt-tipped pens, draw some faces and shoes onto your dolls. Alternatively, you could collage the eyes, mouth and shoes from coloured paper, or attach small wobbly eyes with craft glue. 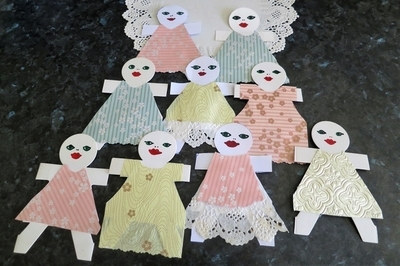 Cut the pastel-coloured craft paper and / or paper doilies to make pretty dresses for the angels. Glue the dresses onto the angels. 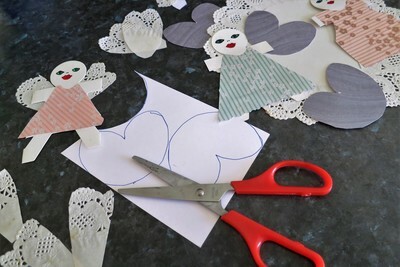 Take some white or shiny paper and cut it as shown below to create your angel’s wings. If you only have plain paper, this is alright too. You can decorate this later with glitter. Glue the wings onto the angels. Glue the cotton wool hair onto your angels. Add some sparkly accents with glitter glue and glitter. Allow the glitter glue to dry. Depending on the type you've used, this might take a few hours. 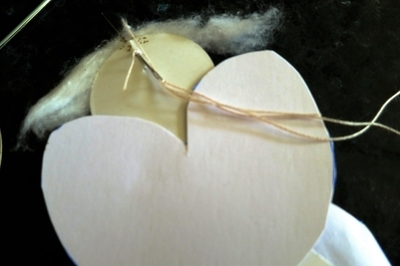 Using a large blunt-ended darning needle, gently thread a length of string or yarn through the top of each angel’s head and tie a knot to secure it. Tie the opposite end of the string to the mobile's frame. I often find that it’s best if differing lengths of string are used, as this provides a layered effect. Refer to the photo below to see what I mean. If you want to embellish your mobile, colourful ribbons and tinsel look wonderful. Your Christmas angel mobile is now complete. Best community garden in Melbourne?